It’s not secret I didn’t like the last episode but if that was the price to pay to get the absolute gem of an episode tonight then it was most definitely a price worth paying for what is probably the episode most likely to stand out this series. The story sees the team accidentally cause the ship to fear being destroyed again only for the machines of the ship to fix it, having had enough of having been abandoned by the human and mech crew, and choose to go out on strike for proper representation of their conditions. 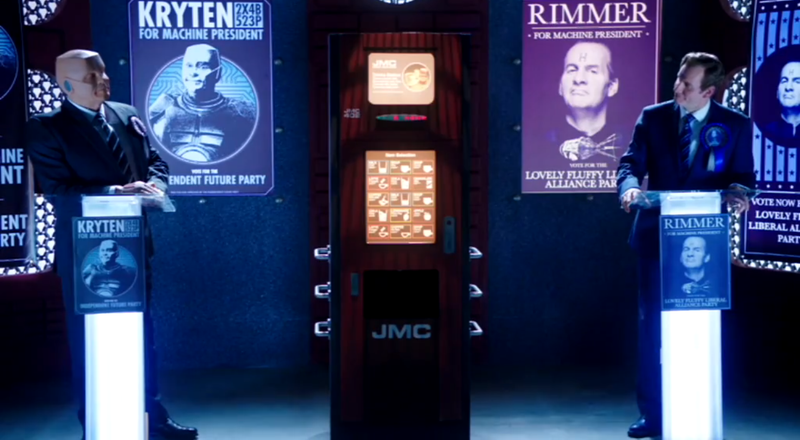 This sees Rimmer and Kryten both stand as candidates for their votes despite the fact neither is really a machine in the same way the others are. Despite their haughty claims of representing the oppressed both soon turn to dishonest tactics and smear campaigns to desperately win votes. As the votes are tied neck and neck the return of a psychotic toaster gives Kryten the win, the machines soon forgotten, and Rimmer stuck in silicon hell. It’s not very hard to see the obvious political satire at work but in these times, as much due to it being made a couple of years back, it thankfully doesn’t restrict itself to just Trump but instead takes fire at very much the insanity of politics, in particular those of the US, as a whole. Right from the setup it begins to lampoon the sorry state of candidates on display, with both Rimmer and Kryten obviously not fit to serve as a president where one is a self-serving idiot while the other will choose humans over the serving machines any day of the week. Straightaway following on from this we see the two playing every trick in the book to win with a “debate” between the two seeing Rimmer lying through his teeth about Silicon Heaven and Kryten using the age old “I’ve been speaking with the common people” tactic. The real highlight however is Rimmer’s answer on when does the life of a document begin, choosing to say he “believes the exact same thing you believe” rather than give any actual opinion on a divisive topic. It’s sort of thing that would happen all the time in real politics but it’s hilarious to watch simple machines lap it up. All series callbacks have been incredibly prevalent but here they’re interwoven directly into the plot as we see the two place attack ads against each other on the ship’s TV system, complete with “paid for by” logos and ominous music to boot. Here classic clips, including Rimmer’s incredibly memorable dress from Quarantine, make an appearance as reasons not to vote for the other, only further highlighting that both are terrible people and neither deserve your vote but given the choice both end up being equally the least terrible option which is shown via the equal votes they get. One of the callbacks we get is Talkie Toaster but while it was funny in some regards it felt a little bit out of place when compared to some of the other gags but it fails to really drag the episode down that much. While nearly the entire episode is devoted to this political showcase it does find the odd moment to look elsewhere, primarily a little story featuring Cat admitting he has vision problems and forced to make the choice as to change and thereby make life easier or simply live in sweet ignorance of his age. It’s no surprise really that the vain man chooses the latter but in an episode where we see everyone pretending to be something they’re not it’s refreshing to see someone so unbothered about being who they are. So that’s Mechocracy, a truly standout classic of an episode that puts the show as witty satire and manages to pull it off.